Installation 01, a Halo fan-game aiming to bring the series’ multiplayer to PC, has received official endorsement from Halo developer 343 Industries. As of now, it is “not under imminent legal threat.” Hooray! Halo giving you the itch for a good ol’ brawl? Here’s a list of the best multiplayer games on PC. In an update posted to the game’s official site, the developers announced that they have been liaising with 343 Industries to ensure it’s not subjected to the same takedown notices that have killed many other fan-made projects (mainly of the Nintendo variety). As a result of those conversations, Installation 01 has had a tentative official go-ahead from the current Halo developers (Bungie moved on from it to work on Destiny after Halo: Reach). That is, as long as it remains non-commercial (including no donations or merchandise) and follows Microsoft’s rules about using its game content. 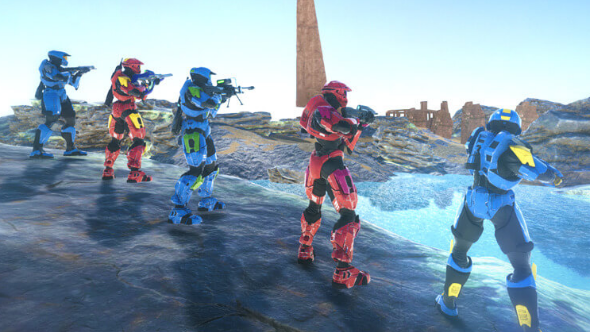 Installation 01 is a community effort to recreate the multiplayer from the original, Bungie-made Halo games for Windows, Mac, and Linux, using the Unity engine. A release date has not yet been announced other than “soon,” although early screenshots and concept art are available on the site. It’s important to note that, while right now the game is legally in the clear, that does not mean Microsoft won’t lower its Mighty Sword of Copyright some time in the future. This is not financial or legal support from 343 Industries, merely an acknowledgement that it exists and that they’re cool with it.